Apart from Pravin Chheda returning to the ruling party, Ranjitsinh, son of NCP MP Vijaysinh Mohite-Patil, also joined the BJP. 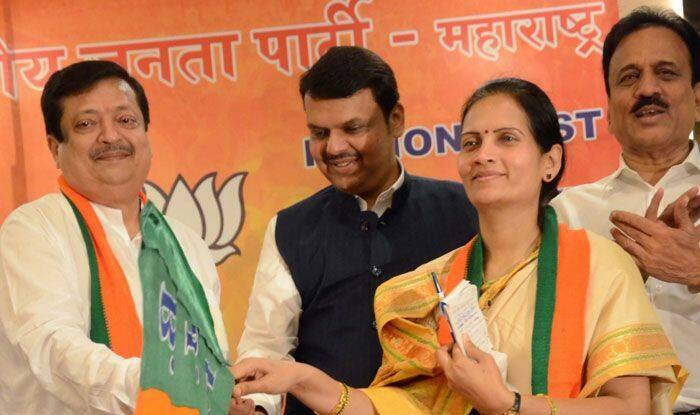 In another setback to the NCP ahead of next month’s polling, its state unit vice president Bharti Pawar Friday joined the BJP, while Congress leader Pravin Chheda also returned to ruling party. The two leaders joined the BJP in the presence of Chief Minister Devendra Fadnavis and other senior functionaries of the party in Mumbai. Speaking on the occasion, Fadnavis claimed that BJP Rajya Sabha MP Sanjay Kakade will continue to be in the party. His remark comes in the wake of reports that Kakade was unhappy with the BJP and that he was likely to join the Congress. “Their works over the past five years have inspired me to join the BJP. I will work for the uplift of the poor and tribals,” she added. He claimed that the Congress had offered him candidature from the Mumbai North East seat, but he ignored the offer and came back to the BJP instead. “I will play the role the party wants me to play now,” Chheda added. Fadnavis said that leaders and workers doing a good job in other parties were joining the BJP trusting Modi’s performance and schemes being carried out by the Centre for the poor and farmers. Fadnavis said the pride of the nation has awakened under Modi’s leadership that isolated Pakistan in the world following the Pulwama attack last month. “Sometimes I feel bad that nationalism is politicised. Some people questioned the surgical strike, while some are of late speaking the language of Pakistan. So, I have to tell them questions will be raised on your patriotism if there is no difference between the language you and Pakistan speak,” he said.